What do the president of FedEx, the former Director of National Intelligence, and 19 other business and military leaders have in common? They’re urging the U.S. to adopt less oil-intensive transportation habits. They say our national security depends on it. 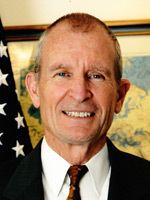 Admiral Dennis Blair, former Director of National Intelligence and Commander in Chief, U.S. Pacific Command, says oil dependence is a threat to national security. Retired military officers have joined forces with business tycoons to form the Energy Security Leadership Council. They’re looking for ways to reduce U.S. oil dependence and improve energy security. In 2008, the ESLC released a study detailing the need for the U.S. to shift from a petroleum-based to an electricity-based transportation sector. Realizing that fuel efficiency and alternative fuels are just two legs of a three-legged stool, the ESLC released a report yesterday, “Transportation Policies for America’s Future,” calling for significant changes in transportation infrastructure [PDF]. America’s transportation network exists almost in a vacuum, the report says, with virtually no connection between how it is designed, how it is funded, and how American families and businesses use it every day. The result is an inefficient system in which system needs are out of alignment with investment, cost is out of alignment with usage, and congestion is threatening to undermine the potential gains associated with recent improvements in vehicle technology and fuel diversification. 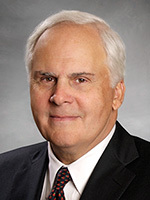 Fedex CEO Frederick Smith agrees. The establishment of national performance metrics, with reduction in oil consumption chief among them, for projects to receive federal funds. Create a new federal formula program, totaling 25 percent of annual federal transportation funding, to reduce congestion and encourage “economically justifiable alternatives to single-occupant travel in internal combustion vehicles” in metropolitan areas. Create a $5 billion-per-year competitive program with funds available to congested metropolitan areas seeking to implement dynamic tolling, improved traffic signals and payment systems, and public transportation solutions. Maintain and improve highway and passenger rail capacity outside of metropolitan areas and along major freight corridors. Remove federal restrictions on state tolling of new and existing roads. On a more serious note, given their military backgrounds, I can understand the focus on security, but I think they rely too heavily on the “terrorist” argument. As an Arab American myself, I find that it’s too easy for some to conflate the real enemies of the United States with all Arabs, especially when one is bombarded with messaging that focuses on Middle East instability. Such instability is not an innate characteristic of Middle Eastern style governance, but largely a product of our meddling. Another product of US government meddling, very much related to the aforementioned meddling: the Interstate Highway System. Anyhow, the point is, let’s call a duck a duck. We have to be frank about where we were and are, as well as how we got ourselves there, before we can understand where we need to be going. That’s my tortured way of saying, the transportation conversation could afford to be more frank about the root causes of the instability of status quo transportation policy. Why is there no bar titled “Bicycle” in this chart? I think the biggest problem is that the average American has to span the chasm from what they expect to be able to do (or feel like the ARE expected to do) and what is truly realistic. The logistics of reshaping our society into a more cohesive, less energy intensive unit are monumental. But since so many are being displaced by foreclosure and unemployment, now is the time to start remolding our collective consciousness into something that accepts that we need to condense our lives. We can move back to realistic communities, and we may out of necessity anyway. Cost are going to rise (to do ANYTHING), and the average American citizen is going to translate rising costs into poor leadership. While I’m not going to defend the shortcomings of our politicians, prices are just going to rise regardless. As the oil supplies become more difficult to obtain we’re all going to see the squeeze on a personal level. I’m happy to see that those mentioned in the article are concerned as well. That is a good sign. Note that “urban bus,” the primary mass transit mode in the U.S., is more energy intensive than passenger cars and only slighlty less energy intensive than light trucks. Why? Because most urban bus services provide basic mobility to places where most people moved on to private motor vehicles. Buses have more seats, but most of those seats are empty. So what can be done in already-built areas of the U.S.? Bicycles, as mentioned. Telecommuting. And filling those bus AND passenger car seats, the latter with some kind of dynamic carpooling system. One that allows suburban and sunbelt residents to give up their cars and get to distributed destinations by paying those who keep them a little more than a transit fare for door to door service. I don’t expect such a report to include it, but can anyone take a gander as to where motorcycles, scooters, dollar vans, and taxicabs fit into that chart? I think bicycles were omitted because zero BTUs divided by however many miles is zero. How’s that for energy security? Well, now I’m completely distracted by the data in that image. Urban buses look bad, but they tend to stop and start so often and run so slowly that their numbers per passenger-mile end up looking pretty bad. Passenger-miles aren’t the best measure in that case, since passengers in built-up urban areas have shorter travel distances. Passenger-miles should probably be balanced out by a temporal measure like passenger-hours. Intercity rail ends up looking kind of bad, though most of Amtrak’s fleet is pulled by diesel locomotives, while a lot of commuter rail, most light rail, and all heavy rail runs with either electric locomotives or as electric multiple units. We should be electrifying the main freight and passenger rail corridors in this country. @Larry: don’t be so sure about the bus thing. Buses aren’t a big share of transit passenger-miles in the US, because so many just feed a rail line, and others are for very local trips, ones that if made by car would require more sprawl and longer drives. 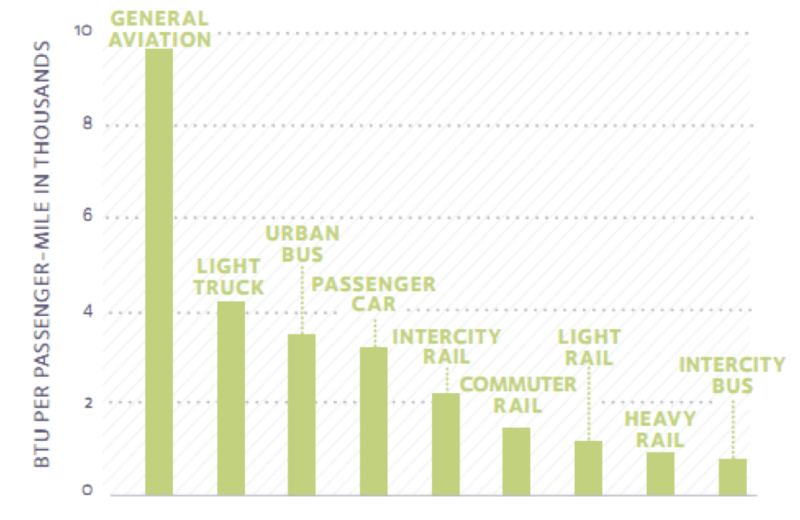 Average passenger-miles per user are about one third to one half on transit as by car. On New York City Transit, ridership splits about 2:1 subway:bus, but passenger-miles split nearly 5.5:1. If you’re feeling like you have too much free time, you can go here and tally the numbers nationwide. Eric — Maybe that explains why it seems like I’ve been eating more on days I don’t bike. Just in case anyone was wondering what I meant by calling a duck a duck, check out the comment by Chris. VERY well articulated. Alon, that is a report for the top 50 transit systems. All the rest are bus only. You can download tables from the national transit database with all the data you want. It is a zipped file that explodes to spreadsheets. Unfortunately I no longer can, because my work network blocks zipped files and the Mac I have at home can’t work with them. But if anybody wants to unzip the latest and e-mail them to me, I’d appreciate it. Perhaps they could be loaded on national Streetsblog somehow. Bike’s aren’t zero BTU’s per mile… construction of the bike is not free, especially if the bike has a carbon frame or whatnot. I’d augment that chart with two bars – bicycle and pedestrian. yeah and the urban buses are stuck in traffic behind cars. what is the average bus speed in manhattan? 3 mph?… plus thats not economical if youre going to have decent headways… bus lanes are the answer. and one other thing, many urban buses now are diesel powered, in the future these could easily be converted to electric trolley buses. interesting how one of the latest wikileaks is that saudi arabia’s oil supply has peaked, that is not a minor event. Well I’ll be damned, cars are better than urban buses. Part of the problem with this sort of graph is that averages can mask a lot of variation. The numbers depend strongly on the number of passengers, which will vary a lot between areas. It also varies by time of day. Those near empty buses running overnight are not too efficient. After all, a bus is bigger than an SUV. Needless to say, however, the energy efficiency of buses is MUCH higher than passenger cars and light trucks in New York City. Or at least in the boroughs other than Staten Island. Also, note the energy efficiency different between urban bus and intercity bus. The auto energy efficiency is a combination of the two. Ah, yeah, I completely forgot the point about how the average urban bus travels in very traffic-jammed cities like New York and Los Angeles. This is actually significant – in New York alone, buses consume 25-33% more fuel per mile than in the rest of the US, including congested places like Orange County. Honestly, the rollout of BRT in the US has been utterly lacking. It should be the standard for any major bus line in a congested area. My point is that if there was some kind of dynamic carpool system, more could be possible with private automobiles too. And that is about the only thing the U.S. could do to radically cut oil use in the short term. I’m not interested in pitting one solution against another – my comment was related strictly to the wild inaccuracy of “Urban Buses” on that graph. Suffice it to say, buses, rail, carpools, vanpools, walking, and biking are all part of the solution – depending on local conditions. If everybody vanpooled, eight to a van, that would solve most of our transportation woes. It is, without a doubt, the most environmentally friendly way to travel with the help of an engine. Good luck with that gargantuan task. A 2011 Chevy Express van with seating for 8 has a rated highway mileage of 17mpg. This gives you a per passenger mileage of 136mpg (8 passengers x 17mpg). A New Flyer Hybrid 60 foot bus gets anywhere from 3-4 mpg, depending on how and where it’s driven and seats 60. That’s anywhere from 180-240mpg per passenger at the standard *seated* capacity of 60 passengers. Add 10-20 standees, a common sight on Seattle’s bus system, and you push the mpg per passenger up to 210-320mpg. Each tool has it’s place and it’s target market. I’m not going to tell everybody they have to ride a bus to save oil and you shouldn’t be forcing everybody to choose a “dynamic carpool”. There is one solution that contains all the various alternatives to 1 person 1 car. It is the new network that will greatly reduce oil use. Light rail to bus, bike lane to subway, various connections depending on locality, geography & political will. And finding some common links among the factions of advocates can have a huge impact on making the alternatives the mainstream. Throw a bike on there just for shits and giggles. Count “food” as fuel. Ever since I got on this bike thang my food intake has doubled even as my waist has dwindled. A common pitfall in energy discussions is these comparison charts. I was coping with them in 1972 at Oregon DOT when we seemingly invented the “Energy Crisis.” This approach ignores the fact that customer behavior changes when they rely on public transportation or bicycles. And a lot of auto fuel is used on short trips that are redundant when users start trip-chaining. Neither of those phenomenon is accounted for with this mechanical engineering approach. Comparing urban buses that spend most of their time in traffic, much of it in peak hours, with autos that are running to Big Lots to look for a picture frame is also worthless. Projecting intercity rail figures from current figures ignores the fact that much of the current equipment is obsolete and that train-lengths are often below their potential size. Fuel consumption does not increase on trains in a linear fashion, so if Amtrak had a car fleet that could handle peak demands without punitive fares, its fuel consumption per passenger mile would drop. My favorite, always bogus since the Oakridge National Laboratories chart of 1972 or 3, is comparing intercity bus with its cramped seating density versus intercity rail with its leg-rest seats, sleeping cars, lounges, etc. When one gets out scratch paper and pencil, it turns out that at an equal seating density, intercity rail and bus are close enough that it doesn’t matter. It is good to see people concerned with national security getting interested in this subject. It’s about time. I am always anxious when pols start using emergent popular ideas buoyed by a desire to slyly attach previously unpopular campaigns. One cannot help but wonder what is the real motive when for so many years now there has been a war over who controls the area around the Caspian Sea owing to its being a pipeline for oil and opium. The lack of any real solution, such as non-POVs for transit (discussed by many folk above), should be a red flag. That there was such a rush to destroy mass public transit and really open up the drug war against a textile popular in the production of books, fuel, clothing and medicine—in order to fully exploit oil and which is now being rolled back so as to fight the war on terror, should be another. Still another red flag should be that this is not the first time such a campaign has been waged. I recall an old friend of mine, Frank Kozik, who had an original poster that was the size of a small billboard. The print was from the early 1940s and had the caption, “When you ride ALONE, you ride with Hitler!” Anyone who understands the wars fought by France, UK and Germany in the late 19th century will understand why WWII was really fought, just as why the U.S. is fighting the two wars now. It is all tied together, and I just cannot help but think that while this bill looks good on top, it’s what is really underneath that should be closely scrutinized. Is it backed by the coal or nuclear industries or pols lobbied by them? is it because oil in Saudi Arabia has peaked, and the process of leaching oil from sand in Canada remains cost-prohibitive? Is FedEx looking to expand its fleet exponentially but desires less traffic for more expedient (and thus higher-rated) travel? It is just too sudden a turn-around after decades of pushing the other way; silly as the speculation may be, there is certain to be something rotten in there. Paying at the Pump for Oil Wars: A Plausible Option?